Figure 12-4: Patient with situs ambiguous, interruption of the inferior vena cava, ventricular septal defect, and polysplenia. A. Posteroanterior view shows that the aortic arch and the heart are left-sided and the stomach (lower arrows) is right-sided. The azygos vein (upper arrow) is markedly enlarged. The heart is mildly enlarged, and there is a moderate increase in pulmonary vascularity. 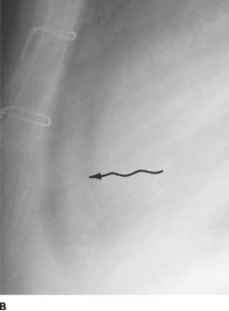 B. Lateral view shows an absent image of the inferior vena cava. The azygos arch (arrow) is markedly dilated. The lung may often reflect the underlying pathophysiology of the heart. By careful evaluation of the pulmonary vasculature, one may narrow down the diagnostic possibilities to a manageable level. For example, if uniform dilatation of all pulmonary vessels is present, the diagnosis of a left-to-right shunt (see -H ; Fig. 12-2,6) is more likely than a left-sided obstructive lesion.  The latter typically shows a cephalic pulmonary blood flow pattern (see Fig. 12-3/1). More detailed analysis of the pulmonary vascularity will be discussed separately below. With right-sided heart failure, the lungs become unusually radiolucent because of decreased pulmonary blood flow (PBF). On the other hand, significant failure on the left side of the heart is characterized by the presence of pulmonary edema and/or a cephalic blood flow pattern Fig. 12-6). Long-standing, severe pulmonary venous hypertension may lead to hemosiderosis and/or ossification of the lung.1011 When right-sided heart failure results from severe left-sided heart failure, the preexisting pulmonary congestion may improve because of the decreased pulmonary blood flow (see Fig. 12-6B). A significantly enlarged heart is always abnormal; however, mild cardiomegaly may reflect a higher than average cardiac output from a normal heart, as seen in athletes in active training. The cardiothoracic ratio remains the simplest and most practical yardstick for assessment of cardiac size.2 The mean value for adults in an upright position in the posteroanterior (PA) view is 44 percent. More accurate roentgen measurements of cardiac size have been well documented1213 but are beyond the scope of the present discussion. 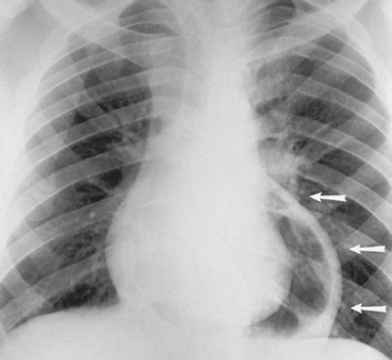 The nature of cardiomegaly usually can be determined by the specific roentgen appearance. As a rule, when the PBF pattern remains normal, cardiac lesions with volume overload tend to present a greater degree of cardiomegaly than lesions with pressure overload alone. For example, patients with aortic stenosis typically show features of left ventricular hypertrophy without dilatation. On the other hand, the left ventricle both dilates and hypertrophies in the case of aortic regurgitation, producing a much larger heart even before the development of congestive heart failure. Both right- and left-sided heart failure can cause gross cardiac enlargement. The associated vascular abnormality in each case, however, is drastically different (see "Pulmonary Vascularity," below). A smaller than average heart is encountered in patients with chronic obstructive pulmonary disease Fig. 12-7A), Addison's disease, anorexia nervosa, and starvation. An abnormally small heart, however, is difficult to define except in a retrospective fashion, when the heart has returned to its normal capacity following successful therapy. For example, in patients with Addison's disease, the heart may become significantly larger following appropriate steroid therapy. Any significant deviation from the normal cardiovascular contour may serve as a clue to the correct diagnosis. For instance, coeur en sabot, a "boot-shaped heart" (see Fig. 12-2Q, is characteristic of tetralogy of Fallot. A bulge along the left cardiac border with a retrosternal double density is virtually diagnostic of left ventricular aneurysm Fig. 12-8). A markedly widened right cardiac contour in association with a straightened left cardiac border is seen frequently in patients with severe mitral stenosis leading to tricuspid regurgitation (see Fig. \2-lD). Besides the familiar double density cast by an enlarged left atrium, other increased densities may be found within the confines of the heart, indicating a variety of dilated vascular structures, e.g., tortuous descending aorta, aortic aneurysm, coronary artery aneurysm, pulmonary varix, etc.3 Furthermore, large cardiac calcifications are seen easily, particularly in lateral and oblique views. If smaller calcific deposits are suspected, they should be verified promptly or ruled out by cardiac fluoroscopy or computed tomographic (CT) scanning (see Chap. 17). Any radiologically detectable calcification in the heart is of clinical importance. The heavier the calcification, the more significant it becomes (see B+fl; Fig. 12-1F). The extent of valvular calcification tends to be proportionate to the severity of the valve stenosis regardless of the other roentgen signs of the disease.2-3'14'15 Calcification of the coronary artery is almost always atherosclerotic in nature. Monckeberg's medial calcification of the coronary system is extremely rare. A fluoroscopically detectable coronary calcification is correlated with major vessel occlusion in 94 percent of patients with chest pain;16 however, the sensitivity of the test is only 40 percent (see "Cardiac Fluoroscopy," below). Recently, electron-beam CT scanning has proved to be a sensitive tool for the detection and quantification of coronary calcifications (see Chap. 17). A negative result may indicate no need for further testing in asymptomatic individuals. A positive result, however, does not necessarily denote obstructive coronary artery disease. The sensitivity for detecting any coronary calcifications is greater than 95 percent with a specificity of Jess than 65percent for significant coronary artery disease. Another use of this method is to identify high-risk patients with calcific nonobstructive atherosclerotic lesions. 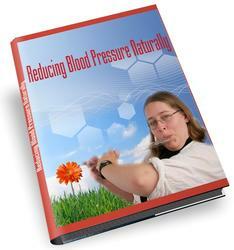 By vigorous therapeutic intervention, one may be able to halt progression or even cause regression of their disease. In fact, the results of such interventions can be correlated with the increase or decrease in coronary calcific plaques15 (see Chap. 17). A calcified ascending aortic aneurysm with aortic regurgitation is highly suggestive of syphilitic aortitis14 (&+S Fig. 12-9). The abnormal lucent areas in and about the heart include (1) displaced subepicardial fat stripes caused by effusion or thickening of the pericardium (Fig. 12-10), (2) pneumopericardium (Fig. 12-11), and (3) pneumomediastinum. Pneumomediastinum is differentiated from pneumopericardium by the fact that the former shows a superior extension of the air strip beyond the confines of the pericardium. 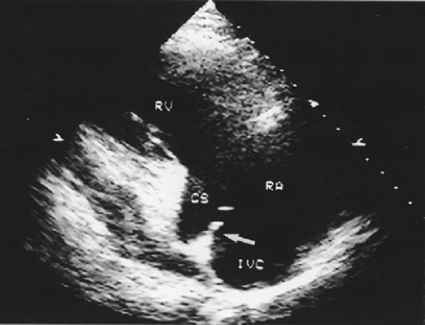 Figure 12-10: Developing pericardial effusion in 2 weeks. A. A magnified view of the retrosternal area showing the hairlike normal pericardium (arrow) sandwiched between the subepicardial fat stripe interiorly and the mediastinal fat stripe exteriorly. The maximal width of normal pericardium is 2 mm. B. The same patient 2 weeks later, with moderate pericardial effusion. The pericardial cavity now measured more than 1 cm in width (arrow). 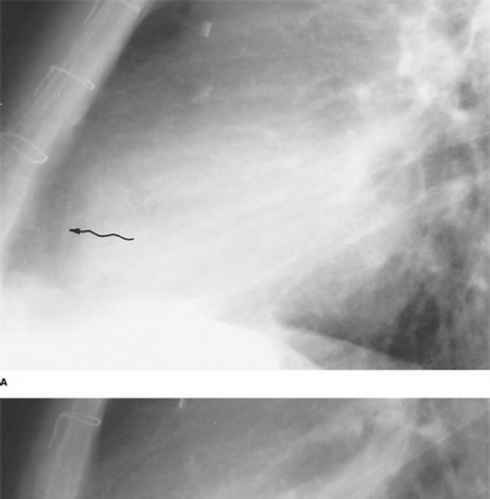 Figure 12-11: Traumatic constrictive-effusive pericarditis in a young man. Following emergent pericardiocentesis and injection of air, a radiograph was taken in the supine position. Air is confined to the left side of the pericardium. Note markedly thickened parietal layer (arrows).